MilitaryVetsPX.com - Personnel Specialist PS for sale. 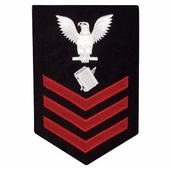 This is the appropriate rating patch for US Navy personnel with the rating of Personnel Specialist PS1, PS2, or PS3. Navy rates are only sold as first class rates and can be cut to second or third class. Personnel Specialist (PS) provide information and couseling about Navy jobs, general education opportunities, and traing to enlisted personnel. They keep records, prepare reports, and maintain files as well as assist enlisted members' families with legal aid or reassignments in hardship situations.